Buy this CD together with 'There's Always Room in Our House'; for Special Offer price of €27.50 including delivery anywhere. 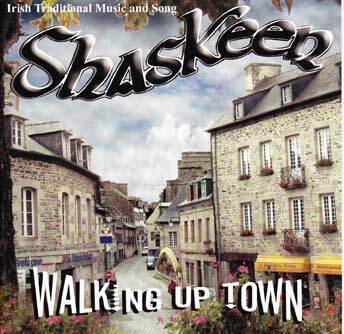 When the great Michael Coleman reel "The Shaskeen" was adopted as the name for this band in 1970, I was working in London and becoming immersed in the cultural vibrancy that the Irish Community were bringing to "The Big Smoke". Little did we know that 38 years later 1 would be introducing our 15th album "Walking up Town". Over the years it has been a privilege to play and perform with many outstanding musicians and singers, too numerous to mention here, each in turn bringing their talents and gifts and helping to create and maintain the unique Shaskeen sound. On behalf of Shaskeen I would like to thank P J Curtis for his major contribution to the creation of this album, as he applied his unique insight and musical wisdom, born out of nearly four decades of music production. We would like to thank our many loyal fans both dancers and listeners who in their turn have been part of the Shaskeen story over the years.